The West Midlands is a metropolitan county in western central England with a 2009 estimated population of 2,638,700. It came into existence as a metropolitan county in 1974 after the passage of the Local Government Act 1972, formed from parts of Staffordshire, Worcestershire and Warwickshire. The county itself is a NUTS 2 region within the wider NUTS 1 region of the same name. The county consists of seven metropolitan boroughs: the City of Birmingham, the City of Coventry, and the City of Wolverhampton, as well as Dudley, Sandwell, Solihull, and Walsall. The West Midlands County Council was abolished on 31 March 1986, and so its districts (the metropolitan boroughs) are now effectively unitary authorities. However, the metropolitan county continues to exist in law and as a geographic frame of reference. The county is sometimes described as the “West Midlands metropolitan area” or the “West Midlands conurbation”, although these have different, and less clearly defined, boundaries. The main conurbation, or urban area, does not include Coventry for example. The name “West Midlands” is also used for the much larger West Midlands region, which sometimes causes confusion. The West Midlands County is one of the most heavily urbanised counties in the UK. Birmingham, Wolverhampton, the Black Country and Solihull together form the most populous conurbation in the United Kingdom outside London, with a combined population of around 2.27 million. However, the West Midlands is not entirely urban; Coventry is separated from the West Midlands conurbation by a stretch of green belt land roughly 15 miles (24 km) across, known as the “Meriden Gap”, which retains a strongly rural character. A smaller piece of green belt between Birmingham, Walsall and West Bromwich includes Barr Beacon and the Sandwell Valley. Although the modern county has only existed since 1974, the settlements of the West Midlands have long been important centres of commerce and industry. Coventry was one of England’s most important cities during the Middle Ages, with its prosperity built upon wool and cloth manufacture. Birmingham and Wolverhampton have a tradition of industry dating back to the 16th century, when small metal-working industries developed. Birmingham was known for its manufacture of small arms, whereas Wolverhampton became a centre of lock manufacture and brass working. The coal and iron ore deposits of the Black Country area provided a ready source of raw materials. The area grew rapidly during the Industrial Revolution, and by the 20th century had grown into one large conurbation. Coventry was slower to develop, but by the early 20th century, it had become an important centre of bicycle and car manufacture. In 1974, the Local Government Act 1972 came into effect, creating the metropolitan county of West Midlands. This area was based on the seven county boroughs and the other non-county boroughs and urban districts around the fringe of the conurbation. The new area consisted of seven new metropolitan boroughs, with Aldridge-Brownhills added to Walsall; Halesowen and Stourbridge to Dudley and Sutton Coldfield to Birmingham. A new borough of Sandwell was formed by the merger of West Bromwich and Warley. The actual designation of Warley itself was abolished and the three towns of Smethwick, Oldbury and Rowley Regis reinstated as component parts of Sandwell, although these areas formed the Warley postal district. Solihull took in much of the suburban fringe to the east of Birmingham, including the former villages of Chelmsley Wood and Castle Bromwich, also Birmingham Airport, and the area of countryside between Solihull and Coventry, whilst Coventry itself received only small changes and Wolverhampton was unaltered. This led to (apart from in the east, with Coventry and the Meriden Gap) quite a tightly defined metropolitan border, excluding such places as Burntwood, Bromsgrove, Cannock, Kidderminster, Lichfield and Wombourne which had been considered for inclusion in the West Midlands metropolitan area by the Redcliffe-Maud Report. The 1974 reform created the West Midlands County Council that covered the entire area and dealt with strategic issues. A new West Midlands Police service was formed covering the entire area, with the West Midlands Constabulary and Birmingham City Police abolished, and also taking over responsibility from the county forces. Margaret Thatcher’s government abolished the metropolitan county councils with the Local Government Act 1985, in March 1986, causing the seven metropolitan boroughs to become de facto unitary authorities with most of the county councils’ functions given to the district councils. 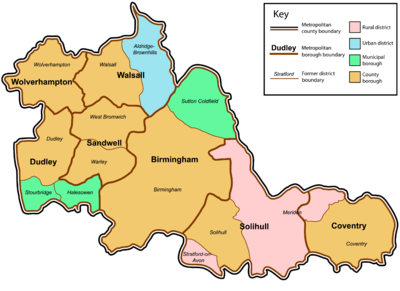 The West Midlands is divided into seven districts called metropolitan boroughs, these are: Birmingham, Coventry, Dudley, Sandwell, Solihull, Walsall and Wolverhampton (see map). Birmingham, Coventry and Wolverhampton have city status. Coventry is a city by ancient prescriptive usage; Birmingham was granted city status in 1889; and Wolverhampton in 2000 as a “Millennium City”. Between 1974 and 1986, the county had a two-tier system of local government, and the seven districts shared power with the county council. However, when the county council was abolished in 1986, most of its functions were devolved to the districts which effectively became unitary authorities, with responsibility for most local authority functions. The West Midlands Passenger Transport Executive; also known as Centro, which is responsible for planning and co-ordinating public transport across the county. The West Midlands Police, who are overseen by a joint Police authority. The West Midlands Fire Service, which is administered by a joint “Fire and Rescue Authority”. These joint-boards are made up of councillors appointed from each of the seven West Midlands district councils. In addition to this, the West Midlands Joint Committee exists as a joint body of the seven districts to co-ordinate matters such as roads and planning. The seven West Midlands councils jointly produce a county-wide Local Transport Plan. The boroughs jointly own a share in Birmingham International Airport, which used to be owned by the county council. 1 April 1994: The western/southern shores of Chasewater, plus the adjacent Jeffreys Swag, were transferred from the Metropolitan Borough of Walsall to the District of Lichfield, Staffordshire. 1995: Part of the Hereford and Worcester parish of Frankley (including the south-west part of Bartley Reservoir) was transferred to Birmingham and became part of the county. The West Midlands is home to numerous sports teams. In football, Aston Villa, Birmingham City, Coventry City, Walsall, West Bromwich Albion and Wolverhampton Wanderers are often referred to as the West Midlands “Big Six”.